Arsenal striker Alexandre Lacazette is a man in form right now, with this remarkable stat summing up just how lethal he’s been in front of goal, especially at the Emirates Stadium. 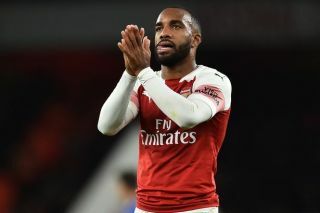 Despite not being in Unai Emery’s starting XI this evening, Lacazette came off the bench to score a beautifully-taken free-kick to make it 5-1 in tonight’s game against Bournemouth. In doing so, Opta now claim Lacazette has scored in five or more consecutive home Premier League matches for the Gunners, meaning he’s the first player to manage this feat since Robin van Persie back in the latter half of the 2011/12 season. Arsenal fans will be delighted with the France international, who has really improved this season under Emery, after initially being slow to settle after joining from Lyon last season. Always prolific in his time in Ligue 1, Lacazette is now showing what he’s all about in the Premier League, doing better in terms of home goals than any Arsenal player for some time.